I'm back wandering in Jaffa. There’s something truly magical about this place and particularly the Artist's Colony where I’m beginning. Established in the 1950's-1960s, Bohemians and other creative types came here because they saw it as having an 'edgy' feel. And it's true - the area has a vibe which is far removed from the busy, distinctly urban, Tel Aviv (only a few kilometres away) and a big reason why so many Israelis have moved here in the last ten years. It’s not hard to see how the area initially became a magnet for artists, and why once they’d settled here they never wanted to leave. With its narrow, cobbled streets - named after Zodiac signs - the quarter has a charm all of its own. The buildings are beautifully restored and at times you could be forgiven for thinking you're lost in a medieval village. This part of Jaffa is hilly though - so be prepared to walk up and down a few stairs. In return you'll be afforded some marvellous views of the entire area, as well as the Mediterranean. 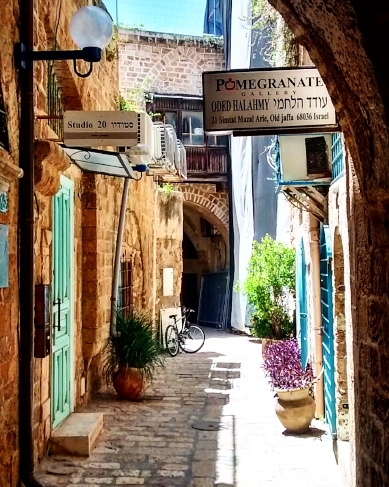 Jaffa itself is thousands of years old, with a history that’s simply incredible. In Biblical times, Jonah set sail on a ship from here in a vain attempt to escape God (his punishment was to be swallowed by a whale). In 636, it was captured by the Arabs and some 400 years later by the Crusaders. Saladin eventually seized control of Jaffa in 1187 but, four years later, Richard the Lionheart wrestled it back. By 1515, it was the Ottomans who were in charge before Napoleon arrived in in 1799. After laying siege to the port and ransacking it, he massacred thousands of enemy soldiers. (There are a couple of his cannons still left to see today). The General also bought with him something deadly - bubonic plague! This subsequently killed thousands of residents. In the 19th century, the German Templars arrived in the area, as did many Egyptian Arabs and a number of Sephardic Jews. Fast forward to the early 20th century - by the time the British Mandate arrived, the area was very mixed - some Christians, some Jews and a majority of Muslims. But the time the War of Independence had ended, however, the Jews had conquered Jaffa and 90% of the Arab population (all but 4,000) had fled. The bottom line? (If there is ever a bottom line!) Jaffa has seen a great deal and experienced much turmoil, upheaval and change in the last few thousands years. Walking down to the harbour, take a look at the "Whale" statue (depicting Jonah's fall into the belly of the monster). Down at the harbour, you can wander along the front and watch fishermen throwing their rods then sitting patiently, sometimes for hours, waiting for one to bite. Walk along the marina area and see boats moored (at the weekends, in particular, owners love taking them out onto the Mediterranean) and stop to grab a bite or a drink at one of the many cafes and restaurants dotted around the area. Many of the renovated hangers here also show exhibitions relating to dance, hi-tech, art and photography. Hanger no. 2 is particularly interesting - it hosts the Dvir Gallery and there's usually something interesting worth seeing. And whilst you're down at the harbour, don't miss the Food Market. It's a fantastic place to find high-quality products (from meats and cheeses to organic vegetables and baked goods) and, like its sister market in the north of Tel Aviv, it hosts a Farmers' Market every Friday from 9am to 2pm. And if you're a fan of seafood, make sure to dine in one of the restaurants. I'm a vegetarian but have eaten with friends at "The Fisherman's Restaurant" in Hanger 2 and the salads alone filled me. For pescatarians, order a seafood platter - its crammed with mussels, calamari and crabmeat. Sit by the water, dine like a prince (with a cold beer in your hand) whilst watching the fishermen opposite bringing in their catch of the day. Trust me, it doesn't get much better than Jaffa.